Home / -Touring- / John Fogerty / Touring / ZZ Top / Touring: John Fogerty and ZZ Top to Do "Blues and Bayous Tour"
Touring: John Fogerty and ZZ Top to Do "Blues and Bayous Tour"
The Blues and Bayous Tour will open May 25 at the Borgata Spy & Resort Event Center in Atlantic City and run through June 29 in Welch, MN with a total of 24 dates on the itinerary. 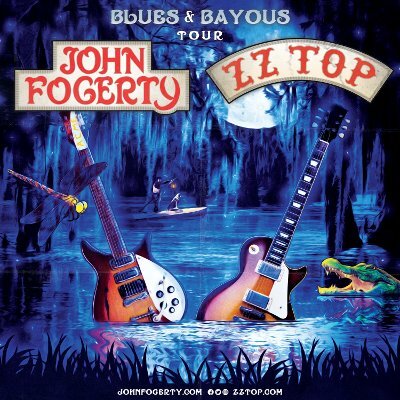 Fogerty said of the tour "ZZ Top is one of my favorite bands, and Billy F Gibbons is one of my all-time favorite guitarists. Riffs, blues and bayous... bucket list!" Gibbons added "John Fogerty along with ZZ Top have been followers of blues and rock since the beginning and we’re looking forward to rippin’ it up together this spring. We’ve got a great show lined up for ya!" Tickets go on sale starting Friday, March 2 at 10 AM local time. And presale tickets become available on Tuesday, February 27th at 10:00am local time.